This is a story about Teampreneur´s (entrepreneur+team member) Power Field, Finnish Summer and enthusiasm for learning and team working. It’s been a hot day. All morning the sun blazed in a cloudless sky, but now little drifts of cotton- white are gathering over the lake. I took several breaks while kayaking, and I went ashore on a few islands on the way. I love diving from a cliff and swimming deep, where the water is many degrees colder than on the surface. Occasionally I just floated in my life jacket for long periods, as the water supported my relaxed body. I was in no hurry. I made coffee in a sooty pot over a fire. Now it’s evening, and I’m camping at one of the many island camp sites built to serve boaters on the lake Puulavesi. There’s chopped firewood, room for a tent, and a tidy outhouse here. I pitched my tent a little farther away from the shore on an amazing moss mattress. The soft moss actually made my sleeping pad unnecessary. It’s the third night of my short summer holiday. I set out in my canoe on Monday, and I’m going to spend the whole week out here. June and July sped by while I was working on my team’s summer project. I often worked around the clock and sometimes all weekend, but now it’s time for a holiday! After a challenging year at Tiimiakatemia, my body and mind need restoration, and my experiences start to ripen into thoughts, insights, and memories. For this, I need solitude. the paddle taking turns making spraying arches in the air. The blades don’t make a sound as they slide into the water. The stranger’s paddling technique looks good. He doesn’t only use his arms, but his whole body from the stomach up twists in the direction of the stroke while the opposite side leg supports the movement under the spray skirt. He lets the kayak slide through the water at its hull speed, not forcing it faster, thus minimizing drag. The bow slices through the calm surface of the lake, just like it’s supposed to do. I don’t recognize the kayaker as he slides past a few metres off, greeting me in a friendly manner. His cheerfully yellow cap fits his tanned skin and orange kayaking life vest. His long, thick, blond hair has been bleached by the sun, and I can see some strands of grey here and there. A couple of strong strokes and the kayak slides high enough on the sand that he can step out without getting his feet wet. We chat and share our day’s travel accounts. We note that both of us have a long journey behind us, and that we haven’t had much to eat. I have a petrol cooker, a couple of kettles, and two kilos of potatoes with me, so I suggest that we roast some sausages on the fire and boil some new potatoes. My idea sounds good, but he says that he has something even better in his kayak. He digs out a one-kilo lake trout that he caught in the afternoon. It’s a beautiful fish, and it only takes a moment to clean it. Soon we have fillets stuck with wooden pegs on a board, slowly cooking by the fire. The petrol cooker is burning hard, trying to bring the potatoes to a boil. “You’re from Tiimiakatemia, aren’t you?” he asks suddenly. He smiles, shifts the fish fillets closer to the embers, and supports the boards with rocks. A big chunk of butter, boiled new potatoes, a little sprinkle of dill and a piece of trout from the board, seasoned with a little crushed sea salt. The taste is heavenly. I try to banish my hunger slowly, savouring the meal, so that every forkful carries me toward fullness, but I don’t get stuffed. The wine is French, bought from a vineyard in Angers. The vinedresser gets up in the middle of the night, when the moon is in the right position, and creeps into his cellar to turn the bottles in a precisely determined position so that the wine matures in the right way and gets its unique taste. There was once a Tiimiakatemia in that village, but then it was reborn in Strasbourg. The wine is cool – the perfect temperature – because it has travelled all day below the water level, at the bottom of the kayak. After our maritime dinner, we sit down on the sand to eat some strawberries. Because the night is cool, the coach is wearing a big wool sweater, looking fresh, like a happy mermaid. I watch carefully as he draws a big, eight-pointed star on the sand. In this first pair, one point is the individual, and the other point is the team. “How much time should you give to the team, and how firmly should you commit to the team’s objectives?” I ask. “So we’re looking for a balance, a win-win situation for both the individual and the team,” I say, summarizing my thoughts. My new friend has heard that we all have an ambitious reading program with the goal of 120 book points. That’s quite a challenge. I’m still a bit unfamiliar with those “Siamese twins” and their teachings. But I do know that each one of us has already acquired tacit knowledge and professional know-how in many different fields, even before our studies. However, we still often start off from almost nothing. The team members’ beliefs and mental models are also still hidden. “Have you noticed that, compared with traditional schools, learning arenas at Tiimiakatemia are broad and challenging?” the coach asks, looking a bit excited about our conversation. I take the last and largest strawberry from the punnet. I gaze at the empty strawberry punnet. There’s nothing more to share there, but the coach seems to have a way with words and summarization. Too bad he can’t conjure more strawberries. “Essays can’t really be mere reflections of the contents of a book,” I say. “They should also tell how the obtained knowledge has been applied into practice in the team company and different projects. I take it that’s what you mean with the word pair ‘theory and practice’. 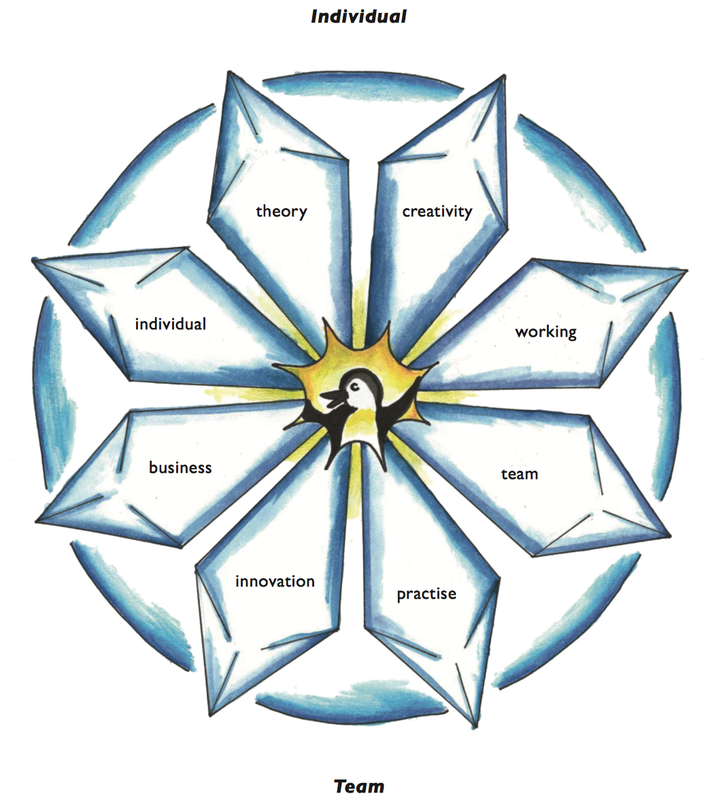 We’ve tried to do it the other way around, too – creating our own theories and models from our practical experiences. The coach laughs heartily, and I can’t keep my face serious either. The coach apologizes for taking my time to test his model. It doesn’t bother me because our dialogue is helping me organize my thoughts and experiences of the past year. We’re already at the third pair, and the night is still young. I think this one’s the most fun: How can the team help turn an individual member’s creativity into an innovation? “Do many beginning team members already have their own business idea that they want to develop in their team?” the coach asks. “Are you really claiming that an individual can actually work in a team and, at the same time, develop his or her own business idea?” the coach asks in a challenging tone. Hey, this brings us at last to the final pair: How can enthusiastic dabbling create real business? That is definitely true. It’s nice to stay in your comfort zone, and you experience stress and pow- erlessness in the discomfort zone, but it’s not all that bad at Tiimiakatemia. “Are you really so disciplined that you can actually abide by that list?” the coach asks. I gaze out on the lake. A local is rowing along, pulling a lure. The lake is calm as a mirror. Here and there, vigorously leaping fish break the surface. Some of them fall on their sides, and we can hear little splashes. On the neighbouring island, there’s a cottage and a sauna with smoke rising from the chimney. Steaming sauna-bathers jump in the lake off the dock, splash around for a while, and head back into the sauna. I can make out the sounds of sauna-whisking. I start when the coach kills two blood-thirsty mosquitoes with one smack. He looks satisfied. I’m surprised and taken aback. The sun sets beyond the lake, and it gets dim. I’m totally exhausted after a long day of kayaking and the evening’s in-depth dialogue. There’s one more thing that the mysterious coach wants to show me. We get up from the beach, and he digs out an oil lamp from his kayak, fills the bowl and lights it with a long match. The light is yellow and warm. I follow the coach as he walks carefully amidst the rocks of the shoreline and finds a familiar path that leads to the highest point of the island. He walks fast, with his feet barely touching the ground. When I get to the top of the hill, he’s already standing by a big rock, gazing out over the lake. I search the horizon, and for a moment I doubt that I can see it. Then I make out a little spot in the sky that suddenly plummets toward the water and almost crashes, but just before striking the water it spreads open its wings, levels out, and snatches a fish. “We call that bird Jonathan Livingstone Seagull,” the coach says. “It always flies and fishes alone. paddled here on kayaks, and one evening they climbed this hill to admire the scenery and the sundown. “And as you can imagine, this rock on which the oil lamp is burning, was named after Johannes Partanen,” he continues to amaze me. “There’s a little roll of paper in that crack over there. Take it, but don’t open it until the morning.” I put my hand in a little crack under the rock, and I find a piece of paper, nicely rolled, and closed with a seal. We stand silent in the still of the night. Finally we head back to camp with the fragile light of the oil lamp flickering over the path. Our steps downward are careful, groping, as we try to go around the stones and tree roots. Finally we get back to the field of moss, and the coach pitches his little tent close to the cliff, where it will be sheltered from the morning wind. We hug and tap each other on the shoulders. It’s been a fantastic summer evening, and the sounds of the night gradually take over. I crawl into my sleeping bag and fall asleep. After a cool night, the sun rises. First it evaporates the moisture from my tent and then its warmth starts gradually descending toward the sleeping Teampreneur. Through my eyelids, I can see the soft light, swarming with stripes, arcs, and circles. It’s time to get up. I peak out of my tent entrance, but I can’t see the coach’s tent. I go to check the place where it had been pitched, but there isn’t a single sign on the moss mattress that anyone had slept on it. I run to the shore. My kayak is still where I pulled it to shore yesterday afternoon. There’s no sign whatsoever of the visitor’s kayak, even though its bow had climbed high on the sand. The place where we sat talking about the Teampreneur’s power field looks smooth, and the diagram has vanished. I must take this paper to the coaches in the fall: maybe they’ll understand the cryptic message. But I’d better not tell them anything about my encounter with the Coach – yes, the Coach, with a capital C. Besides, who would believe it – or this whole story, for that matter?